In the spring of 1933, German society was deeply divided – in the Reichstag elections on 5 March, only a small percentage voted for Hitler. Yet, once he seized power, his creation of a socially inclusive Volksgemeinschaft, promising equality, economic prosperity and the restoration of honor and pride after the humiliating ending of World War I persuaded many Germans to support him and to shut their eyes to dictatorial coercion, concentration camps, secret state police, and the exclusion of large sections of the population. 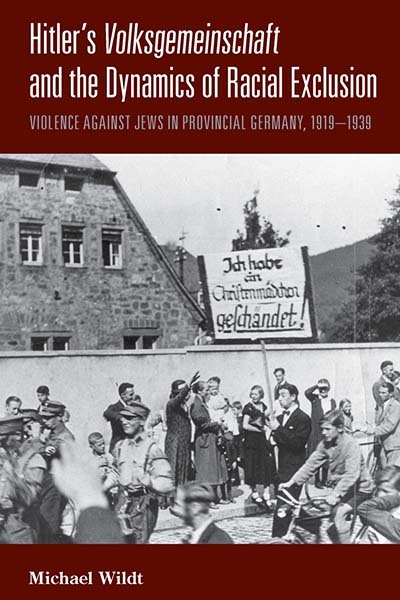 The author argues however, that the everyday practice of exclusion changed German society itself: bureaucratic discrimination and violent anti-Jewish actions destroyed the civil and constitutional order and transformed the German nation into an aggressive and racist society. Based on rich source material, this book offers one of the most comprehensive accounts of this transformation as it traces continuities and discontinuities and the replacement of a legal order with a violent one, the extent of which may not have been intended by those involved. Michael Wildt studied history, cultural studies, and theology at the University of Hamburg. From 1993 to 2009, he was a Research Fellow at the Research Centre for Contemporary History in Hamburg, the Hamburg Institute for Social Research, and The International Institute for Holocaust Research, Yad Vashem, Jerusalem. He is Professor of Modern German History at the Humboldt University in Berlin.